On Saturday, July 19, all World Class corps came together for the first time this season on the same day, competing at the DCI Southwestern Championship in San Antonio's Alamodome. The top twelve corps all surpassed 80 points, up from 10 corps at the same show last year. The top 13 placements all had higher scores than the equal placements at last year's event. There were two judges for General Effect (GE) 1, GE 2, and Percussion, with scores from each of those pairs of judges averaged together for the total caption score. The scores of the two Effect captions are counted for full value, but each of the scores of the three Visual captions (Visual Proficiency, Visual Analysis and Color Guard) and three Music captions (Brass, Music Analysis and Percussion) are first divided in half, with each of those half scores added together for the Total Visual and Total Music scores. After a change in judging passed this winter, the General Effect captions are no longer referred to as Visual GE and Music GE. Those captions are now known as GE 1 and GE 2, with each judge taking more of an overall view of every corps' entire show—along the lines of how the average spectator views a show while sitting in the stands. Blue Devils (1st, 91.650) captured 1st place finishes in GE 1 (tying with The Cadets) and GE 2, Visual Analysis, Color Guard, and Music Analysis. The corps finished 2nd in Visual Proficiency and Brass and 3rd in Percussion. BD finished 0.25 ahead of The Cadets in Total GE, 0.20 ahead in Total Visual, and 0.225 ahead in Total Music. The Cadets (2nd, 90.975) tied for 1st in GE 1 and placed 1st outright in Visual Proficiency. 2nd place finishes were earned in GE 2, Visual Analysis, and Color Guard. The corps finished in 3rd in all Music captions; Brass, Music Analysis, and Percussion, but still placed 2nd in Total Music. Consequently, the corps finished 2nd to Blue Devils in Total GE, Total Visual, and Total Music by the close margins mentioned in the paragraph above. Bluecoats (3rd, 89.850) had one of the most interesting scoring discrepancies of the day, placing 1st on the sheet of one Percussion judge with an 18.5, but 5th from the other with a 17.1, averaging out for 3rd in Percussion with a 17.8. Both GE captions, Visual Proficiency, and Color Guard placed 3rd. Brass took 4th and Visual Analysis 5th. Total GE finished 0.55 under Cadets and Total Visual finished just 0.20 under Cadets. Total Music finished just 0.75 under Cadets and only 0.30 under BD, so one can easily speculate what might have happened had both Percussion scores been closer to each other; either higher or lower. Santa Clara Vanguard (4th, 89.000) took top honors in Percussion, 0.20 over Blue Devils. The two GE captions were 5th and 6th for 5th in Total GE. Visual Analysis placed 3rd and Visual Proficiency and Color Guard both finished 4th, for 4th in Total Visual. Brass finished 5th and Music Analysis 4th, combining with that 1st place in Percussion to finish 3rd in Total Music, tied with Bluecoats (and with the same spreads under the 1st and 2nd place corps as mentioned in the paragraph above). Carolina Crown (5th, 88.700) took 1st in Brass, 0.20 over BD. Next highest finishes were 4th in both GE captions and Visual Analysis. Visual Proficiency and Music Analysis placed 5th, and Color Guard and Percussion placed 6th. Percussion placed 6th from both judges, which was interesting, as the line had beaten Cadets' line in the first shows of the season. The Cavaliers (6th, 86.925) finished 5th in GE 1, Color Guard, and Percussion, and 6th in GE 2 and Music Analysis. Visual Proficiency placed 7th under Boston Crusaders, and Visual Analysis and Brass both placed 7th under Phantom Regiment. Phantom Regiment (7th, 84.725) took 6th in Visual Analysis and Brass, 7th in both GE captions, 8th in Music Analysis and Percussion, 9th in Color Guard, and 10th in Visual Proficiency. Blue Knights (8th, 84.100) took 7th in Color Guard, Music Analysis, and Percussion, 8th in GE 2, Visual Analysis and Brass, and 9th in GE 1 and Visual Proficiency. Boston Crusaders (9th, 82.425) took 6th in Visual Proficiency. The next highest caption placements were 9th in Visual Analysis, Music Analysis, and Percussion. Color Guard placed 10th, GE 2 and Brass finished 11th. GE 1 came in 12th, with one of the two GE 1 judges placing the corps in 14th. Blue Stars (10th, 81.725) took 8th in Color Guard, 9th in Brass, and 10th in GE 1. GE 2, Visual Proficiency, Music Analysis and Percussion all finished in 11th. Visual Analysis placed in 12th. Madison Scouts (11th, 81.425) bested Blue Stars in five captions; taking 8th in GE 1 and Visual Proficiency, 9th in GE 2, and 10th in Visual Analysis and Percussion. Visual Analysis and Brass took 10th, but Color Guard placed 13th, finishing under Crossmen and Colts. Crossmen (12th, 80.250) was 10th in Music Analysis, 11th in GE 1, Visual Analysis and Color Guard, and 12th in GE 2, Visual Proficiency, Brass, and Percussion. Troopers (13th, 77.900) finished 12th in Percussion, the only caption in which the corps placed in the top 12. The corps finished 13th in GE 1, Visual Analysis, and Music Analysis. GE 2 and Brass placed 14th, and Visual Proficiency and Color Guard took 15th. Spirit of Atlanta (14th, 76.550) was 13th in Visual Proficiency and Brass, 14th in GE 1 and Music Analysis, 15th in GE 2 and Visual Analysis, and 16th in Color Guard and Percussion. Colts (15th, 76.100) was 12th in Color Guard, 13th in GE 2, 14th in Visual Proficiency, and 15th in GE 1. 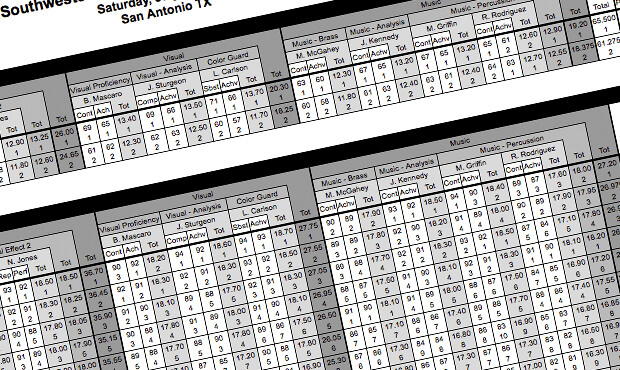 Visual Analysis was 16th, Brass and Percussion 17th, and Music Analysis 18th. Oregon Crusaders (16th, 74.800) was 14th in Visual Analysis and Percussion, 15th in Brass, and 16th in Music Analysis. Both GE captions finished in 17th, Visual Proficiency 18th, and Color Guard 19th. The Academy (17th, 74.775) was 15th in Music Analysis and Percussion, 16th in both GE captions, Visual Proficiency and Brass, 17th in Color Guard, and 18th in Visual Analysis. Pacific Crest (18th, 73.050) took 14th in Color Guard and 18th in both GE captions and Brass. Visual Analysis, Music Analysis and Percussion placed 19th, with Visual Proficiency in 20th. Mandarins (19th, 72.375) took 17th in Visual Analysis and Music Analysis, 18th in Color Guard and Percussion, and 19th in both GE captions, Visual Proficiency and Brass. Jersey Surf (20th, 69.650) placed 17th in Visual Proficiency and 20th in the remaining seven captions. Cascades (21st, 67.200) placed 21st in all eight captions. Pioneer (22nd, 64.125) placed 22nd in all captions. In the Open Class division, Genesis (1st, 65.500) placed 1st in all eight captions and Guardians (2nd, 61.275) placed 2nd in all captions.